I highly recommend this choice as I loved the kick and bbq sauce. I probably could have ordered a double, or two of these, but then I would need to start Lipitor yesterday. Jed went with simple double cheese with secret sauce and enjoyed it, but I think he was eying my Hurt. As I wrote about Edzo's, I enjoy the thin sliced, fresh and well cooked hamburger without a lot of fanfare. I really like the Hurt because it's a little different, tastes great, and is something you wouldn't normally make, or order, for yourself. The fries were good, but don't stand up to the flavor of the burger. They taste fresh, but lack that great french fry salty punch. 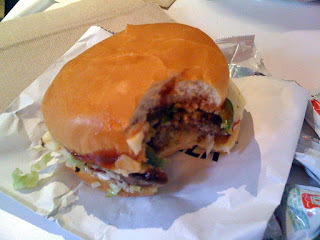 M Burger may not be In 'N Out, but it's Hurt Burger combines flavors I have never tasted and loved. I want to try the shakes, and I can't wait until it warms up even more so they have outdoor seating. 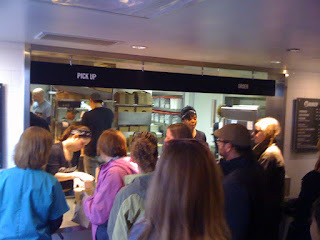 Like most things LEYE, this is a home run and the lines down the street are warranted. 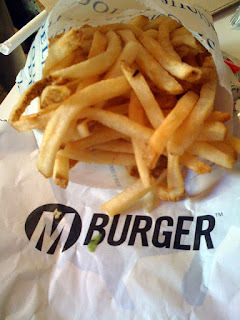 Even without TRU next door, I wouldn't be surprised to see another M Burger coming to at a street corner near you. Any other secret menu options to share? ?